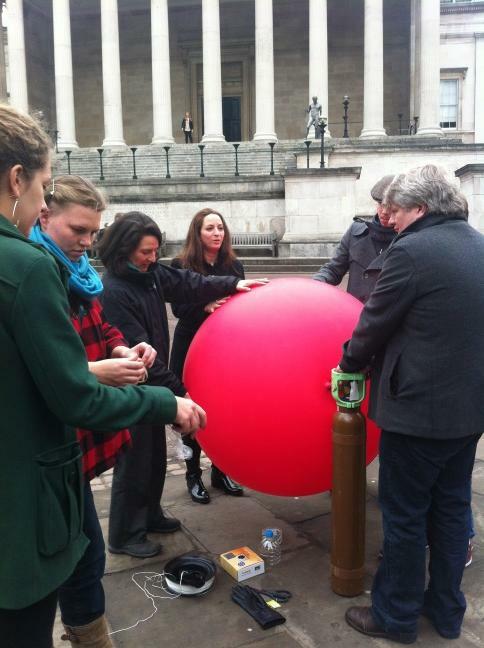 Last week I attended the London Citizen Cyberscience Summit with Lisa Haskel, Arts Catalyst’s resident research engineer, to catch up and connect with latest developments, and to present our Arctic Perspective Initiative. Although the notion of the amateur scientist is ages old, the term “citizen science” is generally used for the systematic collection and analysis of data by networks of volunteers. The most familiar are perhaps volunteer distributed computing projects, such as SETI@home, ClimatePrediction.net, and CERN’s LHC@home, in which people sign up the spare processing capacity of their home computers. A recent wave of projects more creatively engages people in basic research: in Galaxy Zoo, for example, people classify images of galaxies, while the Evolution Megalab recruits volunteers to survey snail shell bands. Day 1 of the summit was presented largely from the professional scientist’s perspective. There was a lot of rhetoric about citizen participation in science, but most discussion focused how to “harness” the power of many minds to help science, how to recruit and incentivise citizens to “generate high quality data” (the phrase “Pavlov’s dogs” was disconcertingly used by one contributor).With a few exceptions, such as iSpot, an online nature community, most projects neglected the value of people’s own expertise and ideas. Surely there are other ways to involve people in science using online technologies other than just crowdsourcing or crowd computing. A few of the presenters began to raise this as an issue, Francois Taddei asking the critical question: who benefits from these projects? The afternoon introduced citizen science projects from around the globe, some of the standard data collection model, others more engaging. 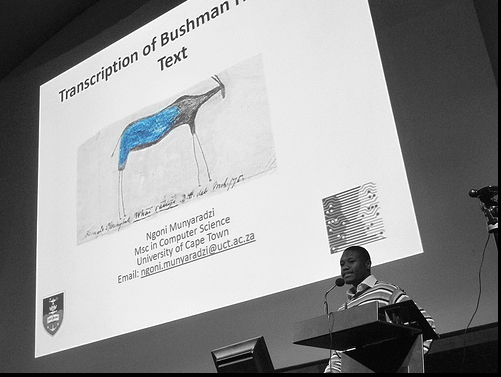 I particularly liked Ngoni Munyaradzi’s project to crowd source translating notebooks and art that contain Bushman culture, and the initiative by the Jane Goodall Institute which trains local people to monitor chimpanzee habitats in Tanzania and Uganda using smartphones. I was very excited by Jerome Lewis’ work with indigenous people in Congo and Rwanda. In 2009, Lewis developed an icon-based interface on a hand-held device that could be used by forest-dwelling people to geotag trees important to their way of life, the mapped information being communicated to logging companies and policy holders. The method has spread like wildfire, Lewis noted, because it’s so effective, allowing peaceful communication via maps. Critically, Lewis noted, the communities themselves have to decide what the benefits are to their participation in such a project. There are no payments or gimmicks to incentivise participation. 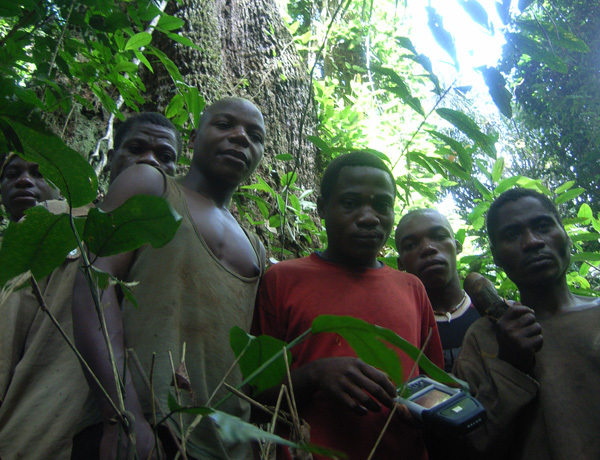 Lewis then outlined his “Hackfest” challenge: to design a new portable device, specifically requested by local people in Congo to monitor poaching, a device that can meet specific requirements, such as accurate geo-referencing under rainforest canopy, withstanding heat and humidity, able to tolerate a week without charge, and updatability. Lewis also wants to work with hackers to create sensors that can enable long-term monitoring of changes caused by mining concessions and climate change. He articulated passionately how important it is to develop accessible analytic tools for use by local people to visualise and analyse results themselves, and that this needs to include the largely excluded: rural people, semi/non-literate people, women, and the urban poor. You can watch Lewis’s presentation here. Lewis’ UCL collaborator Muki Haklay then launched their new Extreme Citizen Science (ExCiteS) initiative, and outlined what they meant by extreme citizen science: firstly, everyone can participate, not just educated people; secondly, extreme citizen science moves the location of citizen science from populated, wealthy parts of the planet to everywhere, and thirdly, it transforms people’s roles in projects from just data collection and entry to shaping the problem and analysing data, participating in problem definition and the entire process of science. The second day of the summit combined presentations with a hands-on hackday. A greater proportion of the discourse felt more in tune with my own interests in co-creation or a bottom-up approach to citizen science. 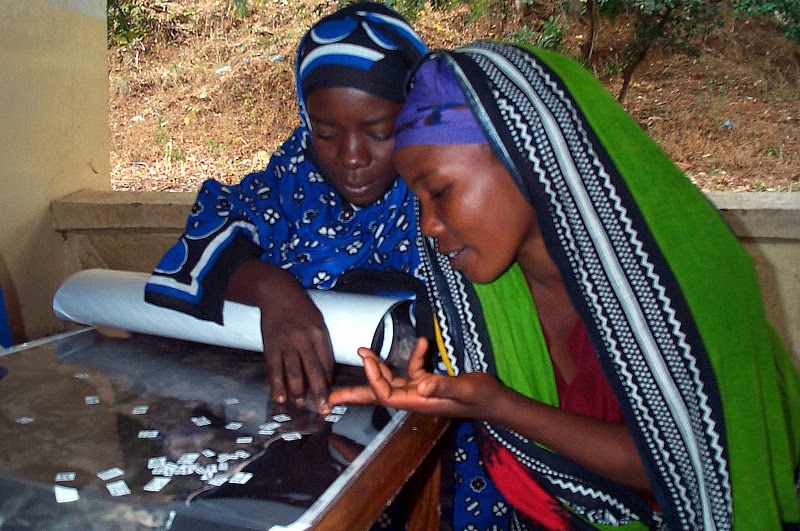 The Public Laboratory for Open Technology and Science (PLOTS), for example, is an activist-led US group developing low-cost DIY open source environmental and health tools to research and monitor their own environments. 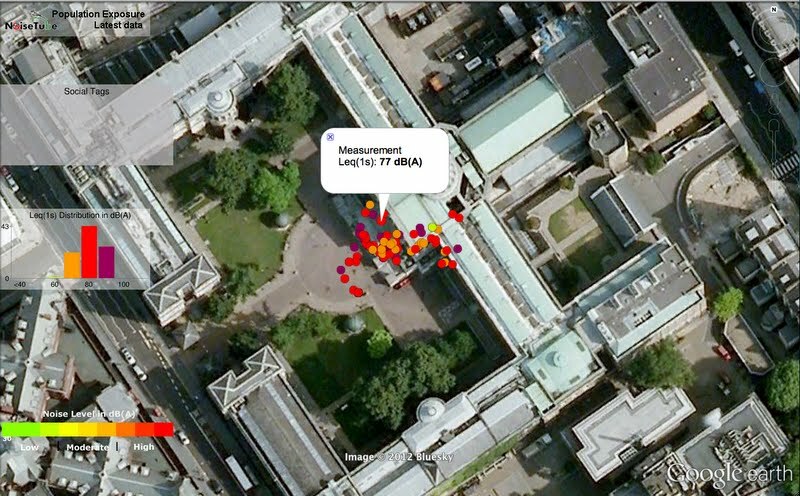 PLOTS demonstrated a mapping kit using a red weather balloon, plastic bottles, and a camera hacked to take infrared digital photos, to which the noise monitoring folk also attached a device. of individuals and non-profit organisations, including Arts Catalyst. Founded by artists Marko Peljhan and Matthew Biederman, its goal is to promote the creation of open source communications, sensing and dissemination infrastructures for the circumpolar region. 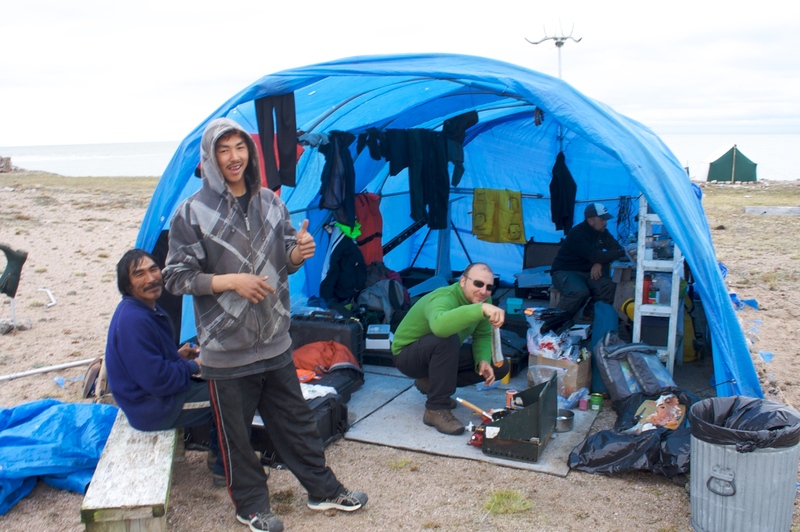 API is a collaboration with the community of Igloolik and other small settlements in Canada’s High Arctic. As Dr Michael Bravo writes in ‘Arctic Geopolitics & Autonomy‘, the API project has developed as a collaborative artistic and technological response to Igloolik’s own considerable arts and media history. Igloolik hosts a permanent population of only 1500 people, but it has for centuries been a crossroads and meeting place for Inuit peoples, traditionally known for regrouping, resting, eating, socialising. Today, it is the home of IsumaTV, an independent interactive network of Inuit and indigenous filmmakers and media workers, and ArtCirq, a community-based circus and multimedia company. Peljhan came to Igloolik with a history of having explored how autonomy can be performed through technological experiments that have traveled to different extreme environments. 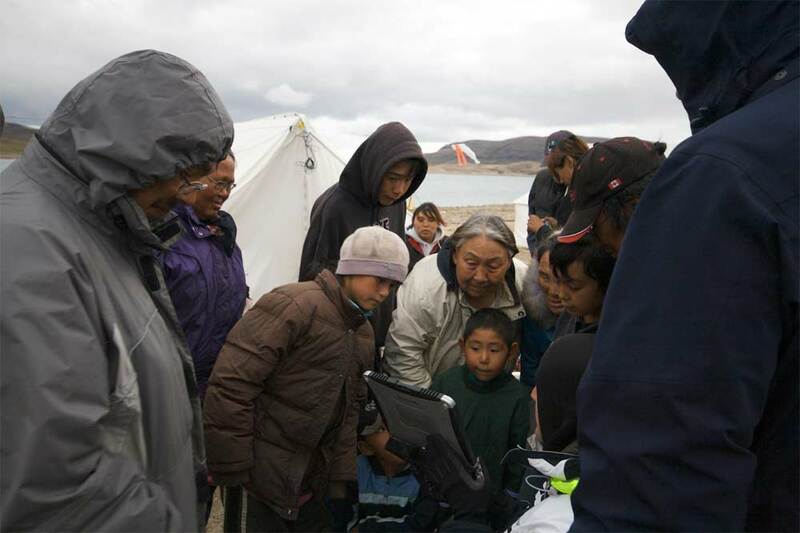 One of API’s evolving projects is to build mobile, habitable living and working units to enable people to live on the land away from settlements (as many Inuit like to do), all the while remaining connected through communications technologies such as live video streaming and data connections. The units will be powered solely with renewable energy sources. 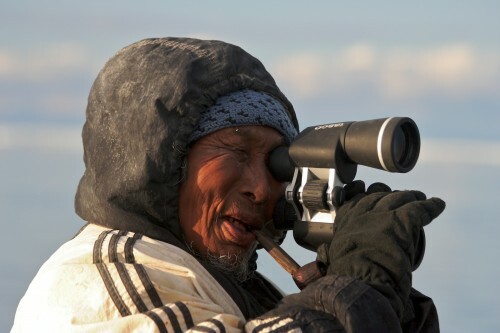 Through these units a number of activities can be pursued: scientific monitoring, filmmaking and editing, sustainability hunting, environmental assessment, and technology research. I presented the history, social context and collaborative approach of API, and Lisa Haskel discussed the sensor network that API is developing for use by local people for a variety of their own purposes, and the data gathering interface that she is working on. You can watch our presentation here and read more about Arctic Perspective Initiative on the Arts Catalyst’s website and the project’s own site. Lisa stayed on for the practical workshops on Day 3, which I didn’t attend, but my mind was buzzing with possibilities and connections.